The Minicom 0VS50113 is an HDMI Repeater for the Minicom DS Vision HDMI solution which is an HD digital multimedia distribution and extension system. 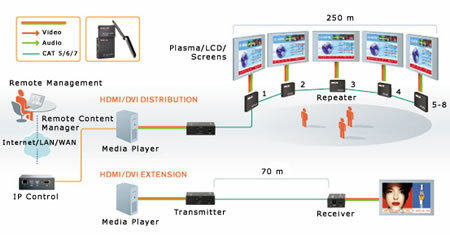 With the DS Vision HDMI system you can distribute digital HDMI content to multiple screens via a unique cascade feature. This is ideal for applications such as advertising screens in supermarket aisles or near check-outs. The AV distribution is done by cascading from one DS Vision HDMI Repeater to the next. DS Vision HDMI is designed for everything from small domestic installations to large commercial applications. Use it for home applications, retail centers, transportation hubs, leisure facilities, educational facilities, corporate environments and more.